Brave and Happy: Isn't all feedback positive? "I can't wait to hear some positive feedback!" What do you mean by positive? Do you want to hear only the good things? 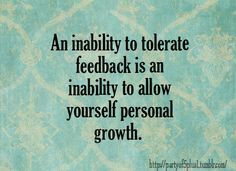 What if there are some points of constructive criticism that will improve your efforts? Do you want to hear those too? For years, I have heard from lots of folks that sandwich-style is a great way to provide feedback. Say something good, then share the area for growth, then end with something good. Does sandwich-style really work? Supposedly, it shows there is more positive than negative and it puts the "bad" feedback in the middle. For some people, it doesn't really matter how many good things are shared, they will only hear the growth area. Is there a better ideology for feedback? I think so. Create a culture where relationships and trust are strong enough between educators so that any feedback is considered positive! Develop and grow a true culture of camaraderie and growth. Make it so that everything you do for kids is open for feedback and improvement. A friend recently told me that the best way to hear the positive side of things from everyone is simple: No matter the relationship, assume positive intent. In other words, hear feedback as if it was spoken from the heart, regardless of who gives it. Regardless of the tone of voice. Tell me that my morning starter rocked! Tell me that the transition to the next activity was terrible! Tell me that I need to speed up the progression of a lesson! Tell my anything that makes me better at what I do! If I choose to hear your feedback as positive, I win. If your comment makes me ask myself a good question, I win? If your words help me improve my practice, I win! After hearing you, I have a decision to make. Will I choose to act on your feedback or not. I can't unhear it but I can choose to do nothing with it! If we have a relationship with a huge emotional bank account balance, it won't bother you if I don't heed your advice. If we simply have a professional relationship, it shouldn't bother you if I choose not to act on your words. Regardless of our relationship, if I make improvements based on your feedback, you have helped me! Either way, I will appreciate your words. I will use them to think about, to question, or to investigate my own practice. The important thing is that we trust each other, we respect each other as talented educators, and we both want to be better and better every day!